Note: some documents use Marius' name and pronouns previous to his transition. Marius Mason was arrested in Cincinnati, Ohio in March 2008 and charged in federal court with 4 counts of arson and conspiracy to commit arson. The charges stemmed from his involvement in environmentally motivated actions claimed by the Earth and Animals Liberation Front that occurred during 1999-2000. Marius and three other individuals were charged with, among other things, the destruction of an office tied to research of genetically modified plants at Michigan State University and the destruction of logging equipment outside of Mesick, Michigan. 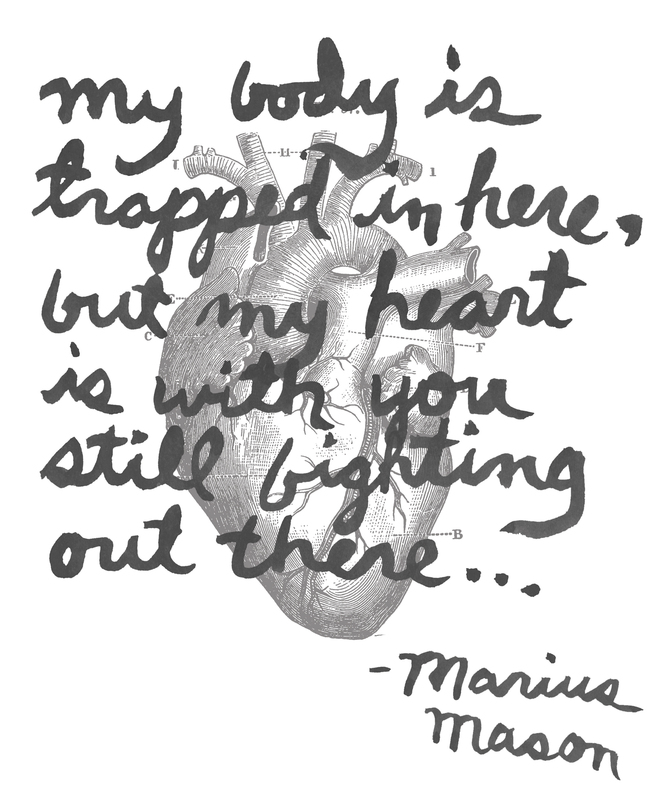 Facing decades in prison, Marius was pressured into signing a plea agreement in September 2008. The plea agreement forced Marius to admit to 3 of the 4 charges in the indictment, as well as to admit his involvement in 12 other acts of sabotage (although he was not charged for any of these other acts). Although the government agreed to not ask for a sentence of more than 240 months, in February of 2009 the judge (who was not bound by the plea agreement) sentenced Marius to an outrageous 262 months in prison– almost 22 years for acts that harmed not a single person or creature. Marius also must pay over $4 million in restitution. Part of the reason Marius received such an egregious sentence was that during his sentencing hearing the judge applied the “Terrorism Enhancement.” The language of Marius’ plea agreement indicated that Marius acknowledged at least two of the counts in his indictment qualified as federal crimes of terrorism under 18 USC § 2332b(g)(5). Marius’ lawyer objected to the application of the enhancement during the sentencing hearing, but the objections fell on deaf ears. Marius filed a timely appeal of his sentence on four bases: (1) his sentence was substantively unreasonable; (2) the government breached his plea agreement; (3) statutory sentence differences in federal arson crimes violate equal protection; and (4) the rule of lenity should have been applied to his case. Unfortunately, in December 2010 the Sixth Circuit Court of Appeals rejected Marius’ appeal on all grounds. Additional Links: Legal documents are open to the public and posted for informational purposes only.